The students, who study at the Ore Valley campus, honed their journalistic and film making skills to quiz the MP to gather content and footage for documentaries that they are currently making. Five students were selected from a class of 30 on the popular Visual Effects and Creative Media Production course and travelled to London on March 11. They were able to research and collect material on a range of different topics including the ownership of Hastings Pier, homelessness, cannabis legalisation, global warming, and student debt. Student Leo Jackson took the former climate change minister to task on a range of environmental issues ranging from plastics in the sea to what she thought of school kids in Hastings going on strike over climate change. “She quickly removed her plastic cup for the table after I raised that issue,” said Leo, who has also travelled to Tenerife to investigate ocean pollution. 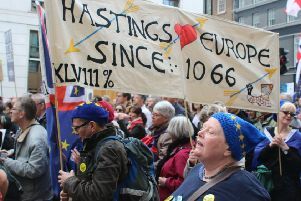 Steven Lewis interviewed her on the ongoing closure and private ownership of Hastings Pier and the subject of a Brexit People’s Vote. He agreed with much of what she said. Once the students have collated and edited their footage they will submit their documentaries for one of their course work units and also make them available to view online via the college’s social media channels.